Ranunculus ficaria of Michigan Flora. A Eurasian species, locally naturalized, especially on river bottoms, as an escape from cultivation. 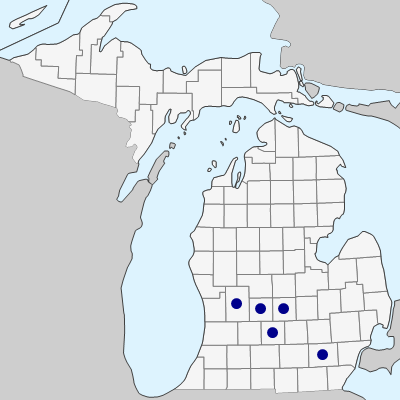 First collected in Michigan in 1982 in Clinton Co. by R. E. Gereau. This is a complex entity in Europe, divided into several subspecies. Our most common plant is the tetraploid subsp. verna, with elongated, usually bulblet bearing stems. The diploid subsp. calthifolia (Rchb.) Nyman, with leaves mostly crowded at the base and short stems lacking bulbils is apparently known from Ionia Co. (as is subsp. verna). See Post et al. (2009) for more information on the North American distribution, and Stace (2009) for nomenclatural and typification information. MICHIGAN FLORA ONLINE. A. A. Reznicek, E. G. Voss, & B. S. Walters. February 2011. University of Michigan. Web. 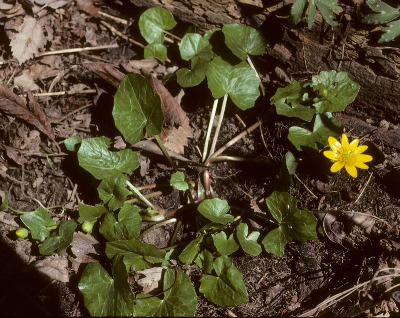 April 21, 2019. https://michiganflora.net/species.aspx?id=2388.